At Fabtech Solutions, we stand with our customers in their time of need. We know there is widespread damage throughout our service area and would like to help. One of our service techs was forced to evacuate and another lost power for several days. 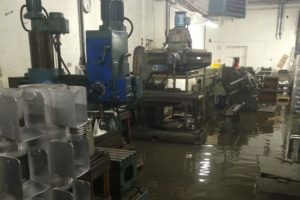 We can help if your shop was flooded or damaged or if your fabrication machinery was operational during an abrupt power outage. We will assist with the startup of the equipment and assess any further damage, while creating a plan to effect all repairs. Our goal is to make sure your metal fabrication equipment is production ready and operational at all times. In the spirit of Service to Our Community. We are offering 10% off our normal service rates to any of our customers that would like our assistance in repairs or would just like the piece of mind that a service tech is on site and inspecting the machinery for any issues or complications before powering the machines.